Taking a detailed patient history is important. Listen carefully to the patient’s past medical history (PMHx) and history of presenting condition (Hx PC). 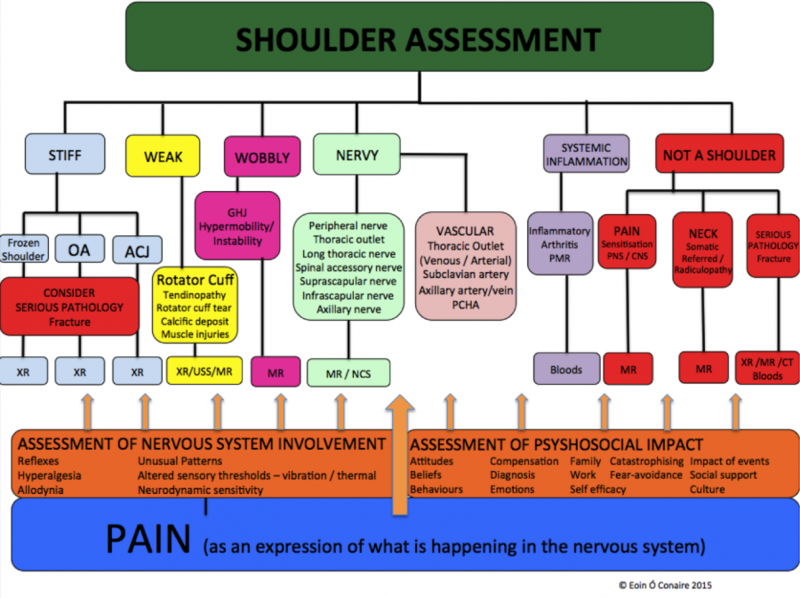 The narrative given by the patient contains much of the information needed to rule out red flags and guide the shoulder examination. The patient may report pain local to the involved shoulder. The symptoms may extend toward the scapula, axilla, anterior chest, along the clavicle, or down the humerus. When taking the patients history it is also important to ask if they have pain or symptoms in other regions such as their cervical or thoracic spine, or elbow. The patient may also report difficulty with overhead activities, lifting objects, activities of daily living, sports or recreational activities.& There are several presentations that may differ depending on the suspected pathology. Patients with suspected subacromial or rotator cuff related impairment may report feelings of weakness, heaviness and/or pain. Shoulder History Exam Questions: These questions may assist the clinician in determining potential pathologies. Please refer to the User's Guide to Musculoskeletal Examination&  &  for more information. Does moving your neck change your symptoms? Do you ever feel unstable during arm movement? When you do actions with your arms over your head, does this aggravate your pain level? When performing actions with your arms over& your head, do your arms feel heavier? Asking about the mechanism of any specific injury is critical, particularly about three factors relating to the time of injury: anatomical site, limb position and subjective experiences. Take care to clarify the patient’s description of the anatomical site. A description of the arm position at the time of the injury is also valuable. For example, falling on an abducted and externally rotated arm increases the risk of shoulder dislocation or subluxation. Finally, exploring the subjective experiences of the patient at the time of injury can be useful. For example, a snapping or cracking sound may be related to a bone or ligament breaking; feeling something ‘pop out’ may suggest a joint dislocation or subluxation. Patients with shoulder pain should be questioned for the presence of red or yellow flags. A thorough medical history and possibly the use of a medical screening form is the initial step in the screening process. The chart below highlights some of the most common red flag conditions for patients with shoulder pain. Determine if patient's symptoms are reflective of a visceral disorder or a serious potential life-threatening illness such as cancer, visceral pathology or fracture. Fractures of the clavicle usually result from a direct blow to the shoulder giving axial compression. The middle 1/3 of the clavicle is most often broken with an incidence of ~80%. Distal clavicle fractures have an incidence of 10-15% and medial clavicle fractures have and incidence of 3 to 5%. Significantly displaced fractures are managed surgically.Mid-shaft clavicle fractures have a lower rate of mal-union and better functional outcomes at one year.& A trial of conservative management may be warranted for non-displaced clavicular fractures. The Fear Avoidance Belief Questionnaire (FABQ) is a tool to assess yellow flags among patients. The FABQ predictive validity is debatable, and is best for the FABQ-W when evaluating workers compensation patients. The overall test-retest reliability is excellent, ICC= .97. Depression Screening tools such as the Beck Depression Inventory (BDI) or the Depression Anxiety Screening Scale (DASS) are useful in screening patients for depression. Psychometric properties of the BDI: a cut-off score of ≥5 for screening, Sn = 90.9%, Sp = 17.6 %. A cut-off score of ≥22 for diagnostic utility, Sn = 27.3%, Sp = 90%. The Pain Catastrophizing Scale, helps determine if the patient is exaggerating their pain and symptoms and the severity of the situations as a whole. Cronbach alpha values reported for the total Pain Catastrophizing Scale (PCS) (α=.87) and factor scales (Rumination α=.87; Magnification α=.60; Helplessness α=.87) were found to be satisfactory. The total PCS score showed strong temporal validity . In a patient population with acute whiplash there was found to be a significant moderate correlation between pain pressure threshold and the pain catastrophizing scale as well as cold pain threshold and the pain catastrophizing scale . The cervical spine can refer pain to the shoulder/scapular region. It is imperative that the cervical spine be screened appropriately as it may be contributing to the patient’s clinical presentation. A comprehensive neurological examination may be warranted in patients that present with a primary complaint of shoulder pain. The presence of neurological symptoms including numbness and tingling may warrant this examination. May include each of the motions stated in the active ROM section. The therapist may opt to include overpressure to further stress the joint. Assessment of the mobility of the joint may indicate hypomobility with in the joint or elicit symptoms. ↑ Flynn T, et al. Users’ guide to the musculoskeletal examination fundamentals for the evidence-based clinician. Evidence in Motion; 2008 . ↑ Murphy D, Hurwitz R. A theoretical model for the development of a diagnosis-based clinical decision rule for the management of patients with spinal pain. 2007; 8: 1, 75 . ↑ Rutkow IM. Rupture of the spleen in infectious mononucleosis: a critical review. Arch Surg. 1978 Jun;113(6):718-20 . ↑ Tamura M, Hoda MA, Klepetko W. Current treatment paradigms of superior sulcus tumours. Eur J Cardiothorac Surg. 2009 Oct;36(4):747-53. Epub 2009 Aug 20 . ↑ Strauss E. Flanagin BA, Mitchell MT, Thistlethwaite WA, Alverdy JC. Usefulness of liver biopsy in chronic hepatitis C. Ann Hepatol 2010;9 Suppl:39-42. ↑ Diagnosis and treatment of atypical presentations of hiatal hernia following bariatric surgery. Obes Surg. 2010 Mar;20(3):386-92. Epub 2009 Oct 24. ↑ Pappano DA, Bass ES. Referred shoulder pain preceding abdominal pain in a teenage girl with gastric perforation. Pediatr Emerg Care. 2006 Dec;22(12):807-9 . ↑ Osman A et al. The Pain Catastophizing Scale:Further Psychometric Evaluation with Adult Samples. Journal of Behavioral Medicine. 2000; Vol.23(4): 351-365. ↑ Rivest K et al. Relationships between pain thresholds, catastrophizing and gender in acute whiplash injury. Journal of Manual Therapy. 2010; Vol 15:154-159. ↑ Calis M, et al. Diagnostic values of clinical diagnostic tests in subacromial impingement syndrome. Ann Rheum Dis, 2000 59, 44-47.